1- Must have a rating of “Very Good “ ( 85 ) in high school or College. 2- Should be of Good Moral Character as proven by Certifications. 3- Should pass the Interview and Admission exams. 4- Should possess good health as proven by a recent health certificate. 5- Must not have or been involved in any civil or criminal case. 6- Must be bright and of alert mind. 9- Birth Certificate duly Authenticated with the ( NSO ) . rules, regulations and policies ( AES form 2 ). 11- ( 4 ) recent ID pictures and ( 1 ) full-body shot. 12- Must have NBI and Police Clearance. 13- Should have no connection whatsoever which will negatively implicate the School. 14- Travel expenses to Baguio City including home return expenses shall be shouldered by the student . 15- Final List of Accepted Students shall be cleared with the Baguio City Police Office. APPLICATION FORM FOR STUDY AT THE AECI. 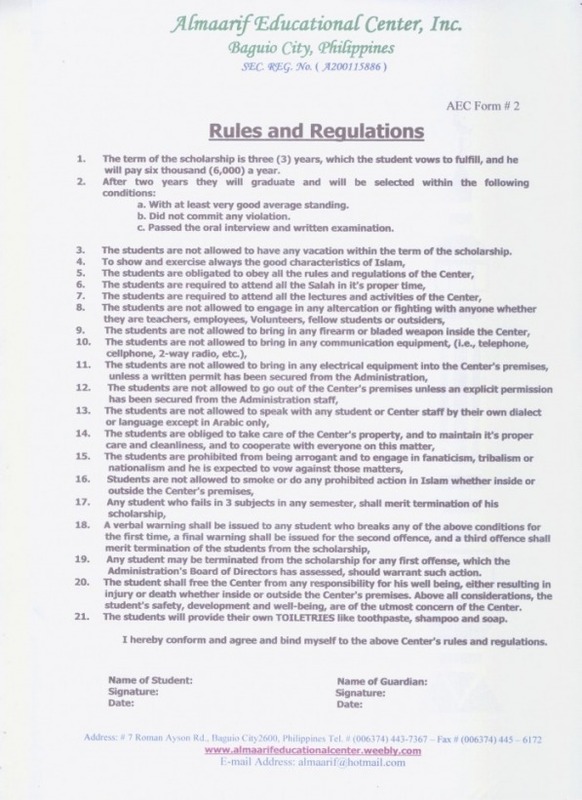 RULES AND REGULATIONS OF THE AECI.